discovers Caleb’s main priority is getting to know his little boy—and making her agree to his proposal. After all these years, nothing has changed—she refuses to marry a man whose idea of fun is dodging bullets. Not after she lost her own cop father when she was just a girl. Allie would do anything to protect her son from that type of pain. 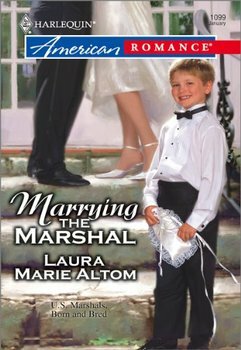 Marrying the marshal is definitely out of the question…but how can Allie refuse, when two identical pairs of green eyes look up at her, wanting her to say yes?